Du Zhenye outperformed his peers in China last year by selling nearly all his stock holdings and piling into bonds. He’s predicting 2019 will be similar for the market. “Bonds will be a sure bet,” said Du, who plans to buy short-dated debt issued by local government financing vehicles, as well as long-dated government and policy bank notes. Falling U.S. Treasury yields and monetary easing by Beijing will boost Chinese bonds, while high financing costs will hurt company profits and affect their share prices, the fund manager said. Changan Xinyi Enhanced Mixed Fund has returned 15 percent since Du took the helm in April. The fund was in the top 1 percent among competitors over the past year as bonds and shares headed in opposite directions. Chinese sovereign notes emerged among the world’s best performers in 2018, while equities plunged into a bear market -- the Shanghai Composite Index fell more than any other major stock gauge. The central bank has cut the reserve-requirement ratio for lenders five times since early last year to loosen liquidity and boost economic growth. That’s yet to spur demand, with data from exports to retail sales trailing analysts’ forecasts. The yield on U.S. government bonds has meanwhile fallen from a seven-year high in October amid growing expectations the Federal Reserve may halt interest rate hikes. China’s economy will face “huge pressure” under tight monetary policy, so authorities are likely to loosen conditions by cutting the benchmark interest-rate for the first time since 2015, Du said. Companies’ high leverage combined with weak demand will worsen profits, he added. Wednesday morning, the People’s Bank of China injected a net 560 billion yuan ($83 billion) into the financial system through open-market operations, the biggest one-day addition on record. Du’s fund held less than 3 percent of its capital in stocks at the end of September, compared with 29 percent at the end of the first quarter, according to company statements. This year, it will focus on picking corporate notes that were “mistakenly killed” in 2018 as concern over a spike in defaults mounted, he said. The fund will avoid risks associated with debt sold by private companies. 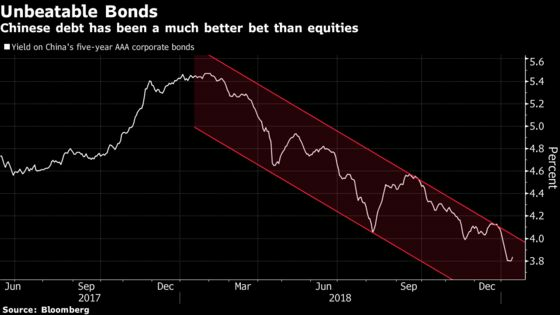 The yield on China’s 10-year government bonds fell 9 basis points this year through Tuesday to 3.14 percent, while that on five-year AAA corporate debt declined 19 basis points to 3.87 percent. The Shanghai Composite has advanced 3.1 percent in 2019. It ended up falling 25 percent last year, despite a solid start with a 5.3 percent gain in January.